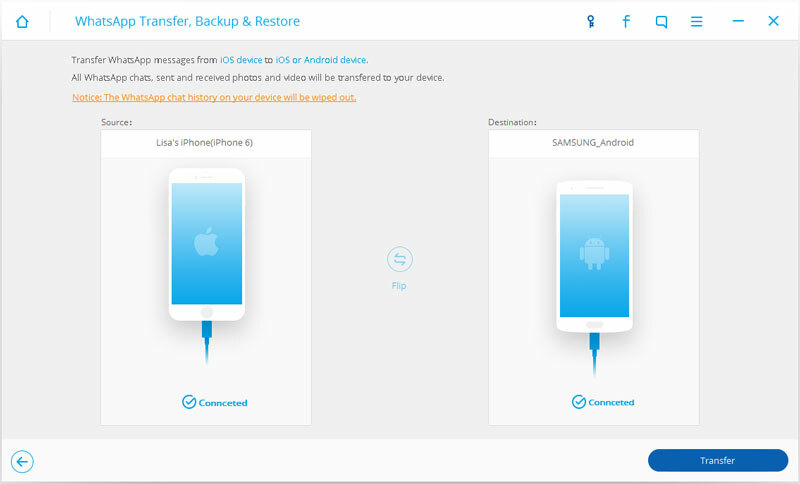 Let you transfer your iOS WhatsApp to your iPhone, iPod Touch, iPad, and Android devices. You can also backup the data and export to your PC. Fully compatible iPhone, iPad, iPod Touch with iOS 6.0 ~ 10.3.x. Whether you own just one device or you just want to switch to a new device, this program can help you transfer the history of WhatsApp chats selectively between your old device and the new one. If you want to switch to an Android device, you can use this software to transfer your WhatsApp chats from your iOS device to the Android device. You can also transfer the attachments related to your WhatsApp chats such as pictures, videos, documents, and GIFs. 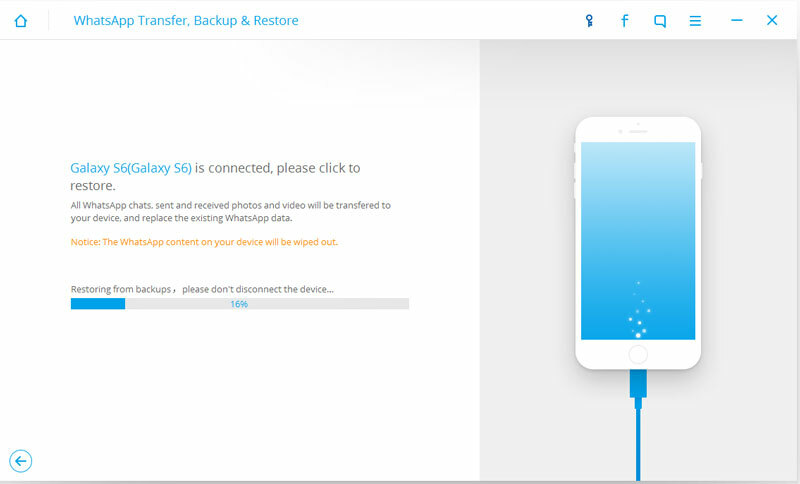 Dr.Fone Toolkit - iOS WhatsApp Transfer, Backup& Restore makes a backup of WhatsApp history much simpler than ever. When you connect your iOS device and activate One Click, the program backs up the data automatically. You can preview to check or uncheck the data you want and transfer it to your PC in the form of HTML file to print or read. You can delete or restore your WhatsApp backup to your Android/ iOS device whenever you want with One Click. Recover lost data from iOS Device, iTunes and iCloud backup files. Fix issues: Stuck in recovery mode, white Apple logo, frozen, etc. Record videos, games or other screen activities on your iPhone. 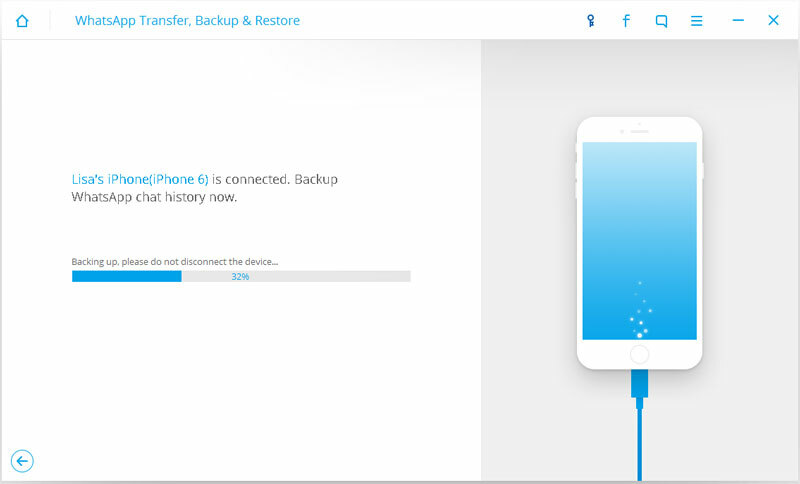 Backup iOS data to PC for share, print or restore when necessary. Backup Kik messenger chats, photos, videos, sketches, etc. to PC. Backup/restore all Viber messages, including chats, media files, etc. Delete all documents and data on iOS devices completely and permanently. Completely delete any iOS contacts, messages, notes, media files, etc. 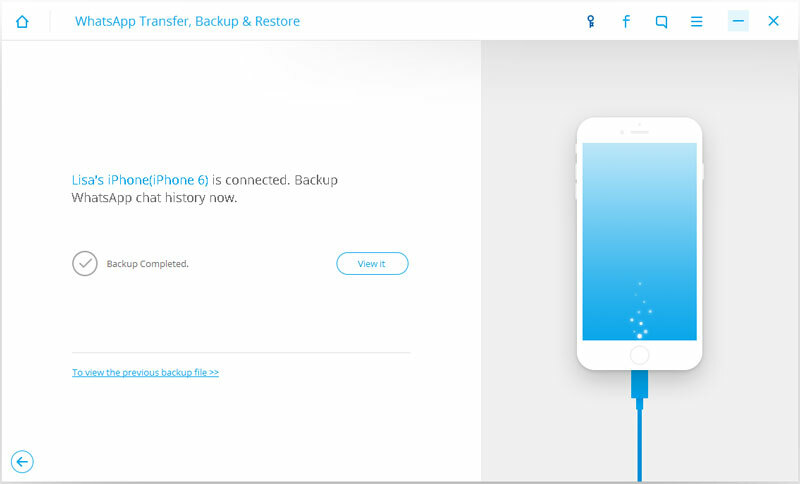 dr.fone toolkit now supports to backup and restore WhatsApp data on iOS devices or transfer WhatsApp data from iOS device to iOS device or Android device. 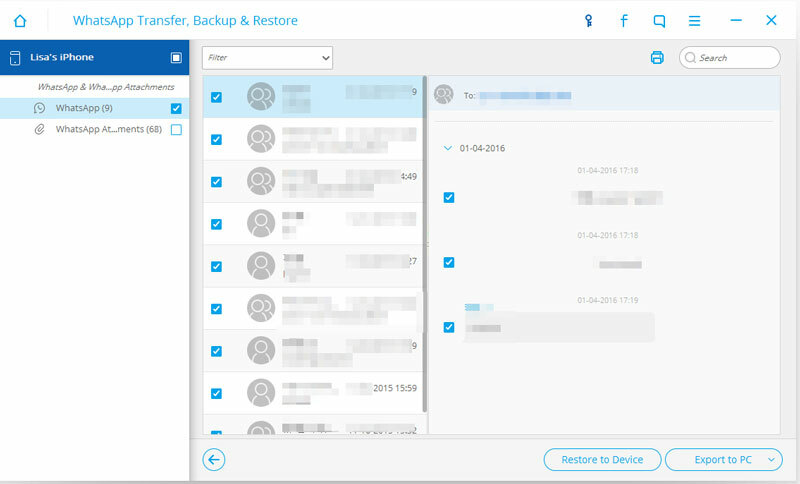 Users can backup iPhone WhatsApp messages and WhatsApp message attachments, export them to the computer and restore the backup to device. 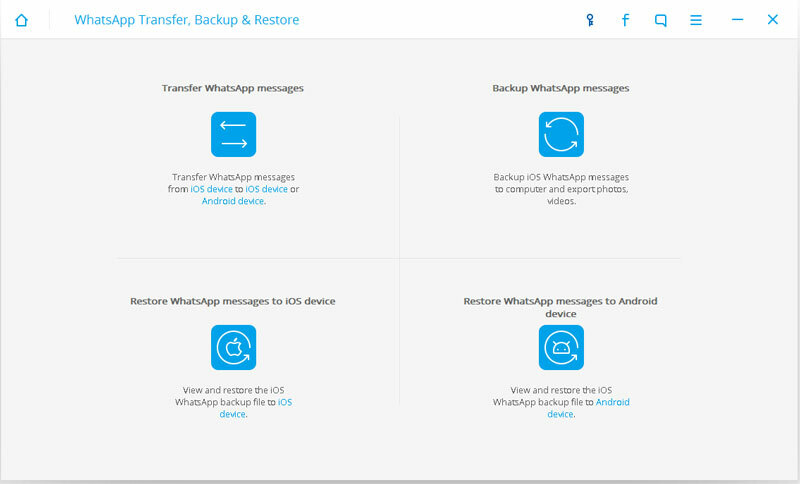 After launch dr.fone toolkit on your computer, select "Backup & Restore WhatsApp" option from the tool list. Then you will see the window as follows. Next, let's check how to use the features here one by one. To transfer WhatsApp messages from iOS devices to another iOS device or Android devices, you can choose to click "Transfer WhatsApp messages". Then connect your iOS devices or Android device to the computer. Once the program detects them, you will get the window as follows. Now, click "Trasnfer" to begin the WhatsApp message transfer. Since the transfer here will erase existing WhatsApp messages from the destination device, you need to click "Yes" to confirm this action if you still want to move forward. Then the transfer process really starts. During the transfer, you don't need to do anything. Just keep your devices are connected well and then wait for the end. When you see the window below, you can disconnect your device and view the transferred data on your device. To backup WhatsApp messages from iOS devices to your computer, you need to choose "Backup WhatsApp messages". Get your iPhone or iPad connected to the computer. Then you'll see the window of the program as follows. Once your device is recognized, you can click "Backup" to begin the process. Once the backup begins, you can sit and wait. The program will finish the process automatically. When you're told that the backup is completed, you will see the window below. Here, you can click "View it" to check the backup file if you want. 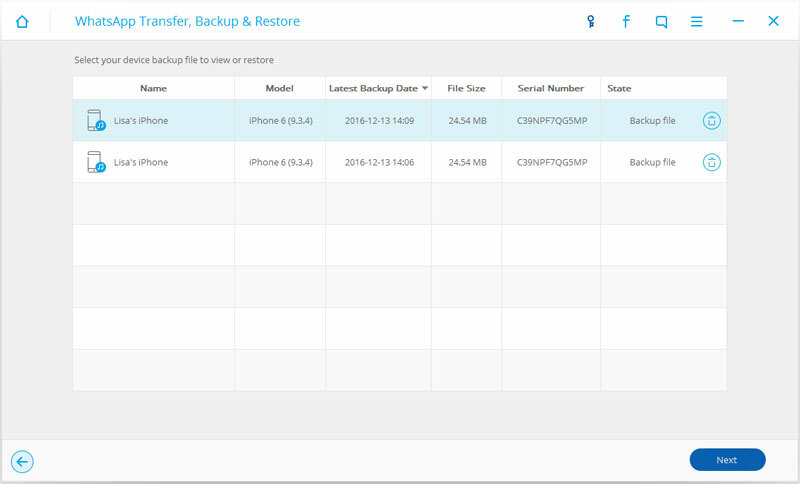 Choose the backup file that you want to view if there are more than one backup file listed. Then you will see all the details. 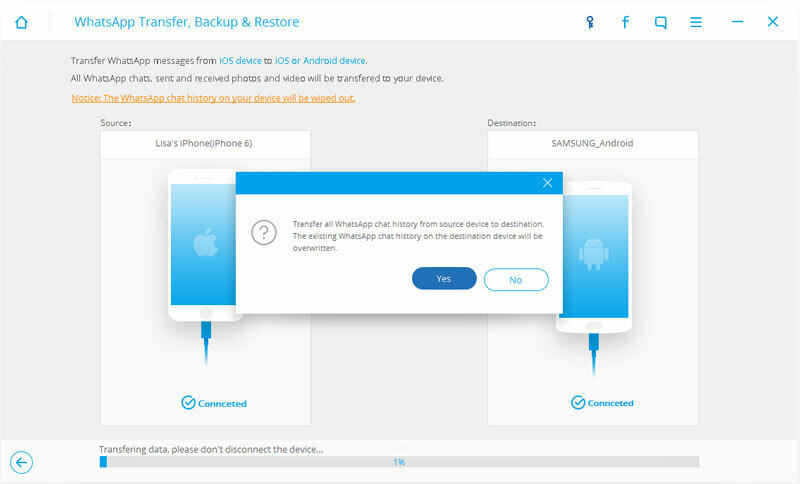 Choose any item you want to export to your computer or restore to your device. To restoreWhatsApp messagesto your iOS devices, you need to choose "Restore WhatsApp messages to iOS device". Get your iPhone or iPad connected to the computer. Then you'll see all your backup files listed. You can choose a backup file and click "Next" to directly restore it to your iPhone or iPad as follows. 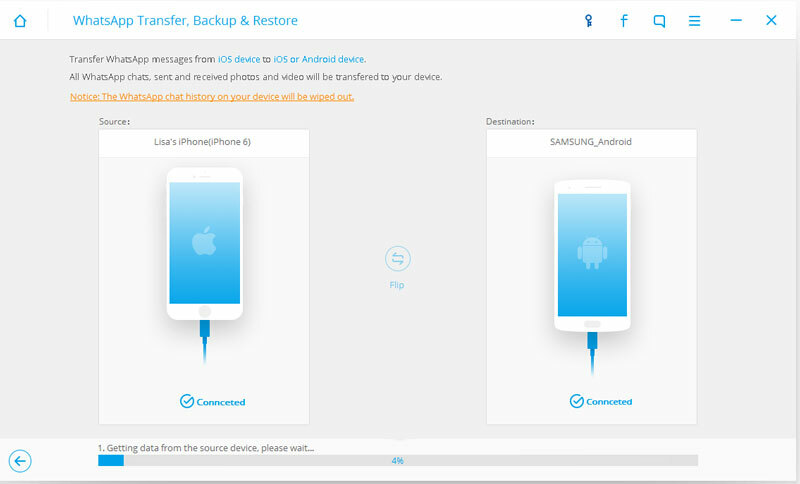 Or you can choose to view the backup file first, and then selectively choose what you want to restore it to your device. To restore WhatsApp messages to your Android devices, you need to choose "Restore WhatsApp messages to Android device". Get your Android phone or tablet connected to the computer. Then you'll see the window of the program as follows. 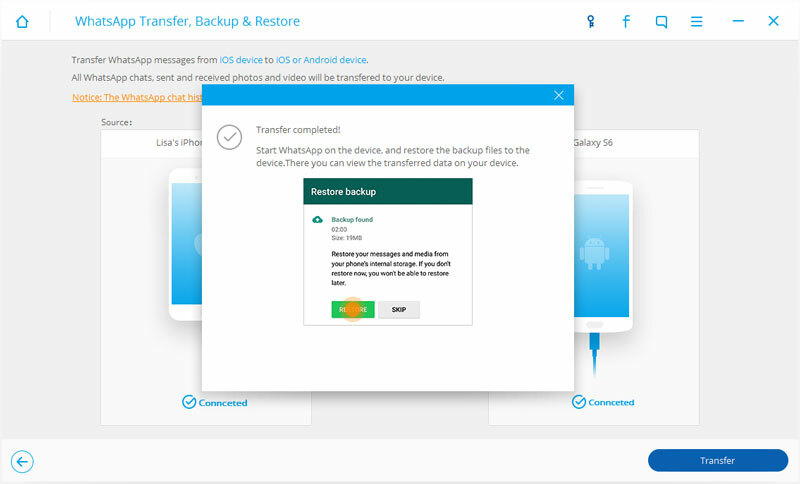 You can choose a backup file and click "Next" to directly restore it to your Android device as follows.